The Picture of Dorian Gray was first published in 1891. It was considered quite a shocking book at the time, but I would be surprised if anything about the book shocks a modern-day reader. There are three main characters in the story: a talented artist named Basil Hallward, Lord Henry (Harry) Wotton, and Dorian Gray. The first chapter of the book is set in Basil’s studio, on a warm summer’s day with the scent of the flowers in the garden blowing in through the open door. Wotton is sitting in the studio, smoking cigarettes, and watching Basil work on a full-length portrait. Wotton is not the subject of the picture, and he does not recognize the young man who has been captured in paint, but the subject is extraordinary in his good looks and both men agree that the portrait is the best picture Basil has ever painted. While they are talking Basil accidentally mentions the name of his subject—Dorian Gray—and Wotton is keen to know all about him. Basil talks freely enough about Gray, but he is not keen on Wotton meeting him and he tells him so. Unfortunately for Basil, the words have barely left his mouth when his butler enters the room and announces that Mr Dorian Gray has arrived. When Dorian sees how magnificent the portrait is, for the first time he gets a sense of his own beauty and, with Wotton’s words still running through his mind, he casts his mind forward to a day when he will no longer be young and beautiful. “How sad it is,” he murmurs; thinking about how he will one day be old and decrepit, but the picture will be forever young, and he wishes that it could be the other way around. “I would give my soul for that!” he says. His words are quickly forgotten, but some time later, when Dorian causes a young girl to take her own life, he notices a change in the painting—a touch of cruelty around the mouth. that was not there before—and he remembers his wish. Basil Hallward takes a back seat for most of the book. Once they have been introduced, Dorian finds the company of Harry Wotton preferable to that of the painter. Wotton, for his part, sees Dorian as something a little like clay, that he can mould into whatever image he pleases. Under Wotton’s influence, Dorian’s life becomes filled with excess, debauchery, and pleasure. Many terrible rumours circulate, but those who don’t know Dorian, and even some who do, find the rumours hard to believe because his face remains so angelic. Only Dorian knows the truth and he often sits in the locked schoolroom at the top of his house, where he takes a perverse pleasure in looking at the picture that bears the marks of his sin. My copy of The Picture of Dorian Gray (Popular Penguin Classics) is 256 pages long and even though the story was written so long ago, and is set in a time when people drove around in horse-drawn carriages, I can’t say that I found the story dated. The Picture of Dorian Gray is a story about sin and vanity and friendships that fall by the wayside. Also of life and death. These subjects never go out of fashion. There is a section, in the middle of the book, that gets a little boring; but it is only a matter of a few pages. The section describes in long, monotonous detail how Dorian took up the study of different stones, and linens and perfumes and God only know what. It’s boring! I didn’t want to know! Perhaps all this was mentioned in order to make some kind of a point. If it was, it went completely over my head. Dorian Gray destroys a lot of lives and one of the saddest parts of the book—in my opinion, anyway—is when he murders Basil Hallward. Dorian has never allowed anyone to see the grotesque picture that was once a masterpiece, and when Basil comes to speak to Dorian about certain rumours, which he does not want to believe, Dorian delights in showing him the picture that proves his corruption. Then, overcome with a sudden loathing for Basil, Dorian sticks a knife in his friend’s neck and, in a way; it almost seems that Dorian is sacrificing his friend in front of the painting that has become a monument to his evil. 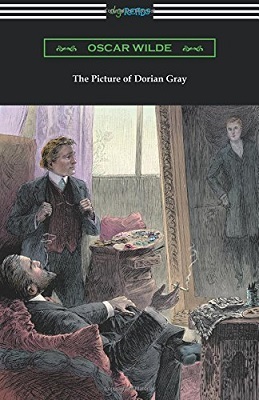 The picture of Dorian Gray is probably more a story about corruption than of anything else, but it is a timeless classic that I can easily recommend to any and all readers.